The work of Zorka Ságlová distinguishes itself in its unusual versatility on one hand, and its extraordinary continuity and internal cohesion on the other. The scale of her formal expression has ranged from classical painting and drawing to spatial objects, assemblages, stamp art, or so-called action drawings, as well as her still somewhat neglected photographic work to her vast artistic tapestries and work in the countryside that moves somewhere on the edge of action art and land art. 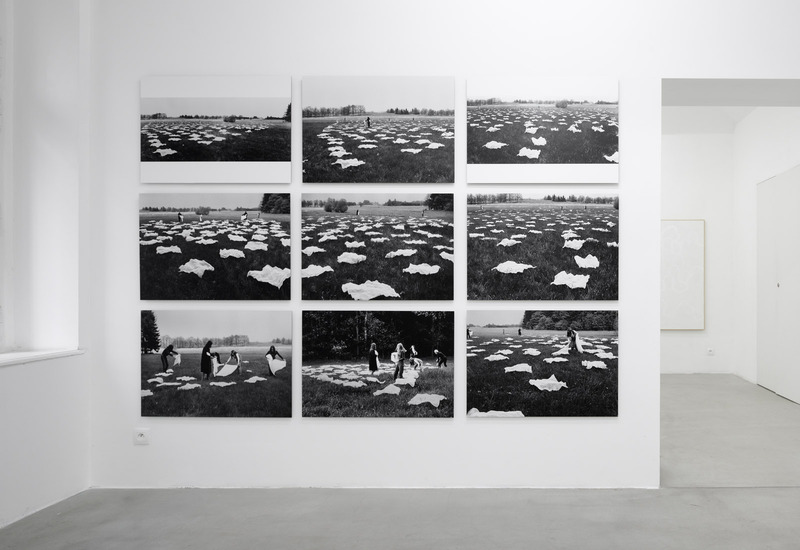 For Zorka Ságlová, it is typical to repeatedly rework and update a once discovered motif so that she adds to it new (and often unexpected) layers or presents it in new contexts. This approach makes her work a fascinating journey through a labyrinth of human cultural history as well as her own artistic life experiences. The fidelity with which the artist preserves the basic principles of her work makes her an outstanding conceptual artist. 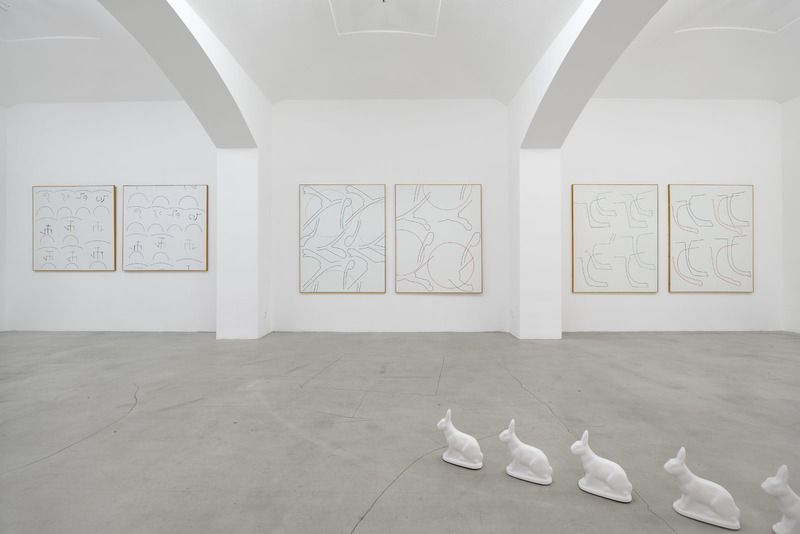 It had long been the artist’s wish to prepare an exhibition whose main theme was the color white. 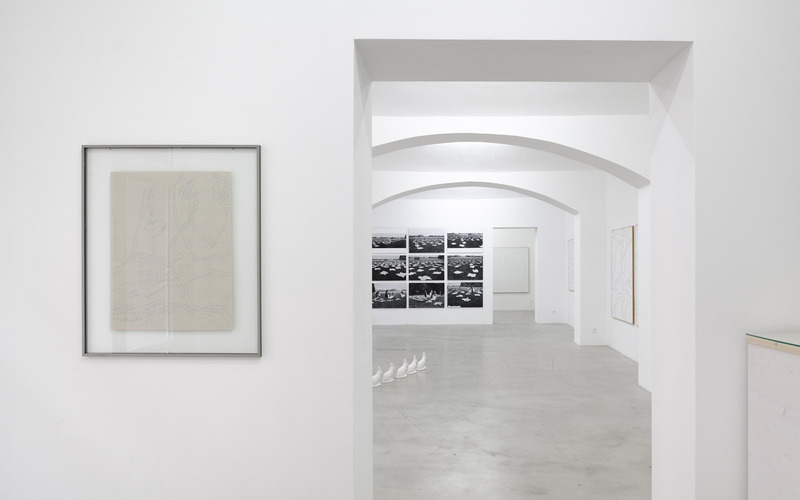 The white area, pure and free from all narrative and incapable expressions of illusive space, has thus become the common denominator of the selected works, which are actually a cross-section of her work from the monochromatic structures of the 1960s up to the Family Portrait from the end of the 1990s or the Bretagne coastal assemblages created at the beginning of the new millennium. 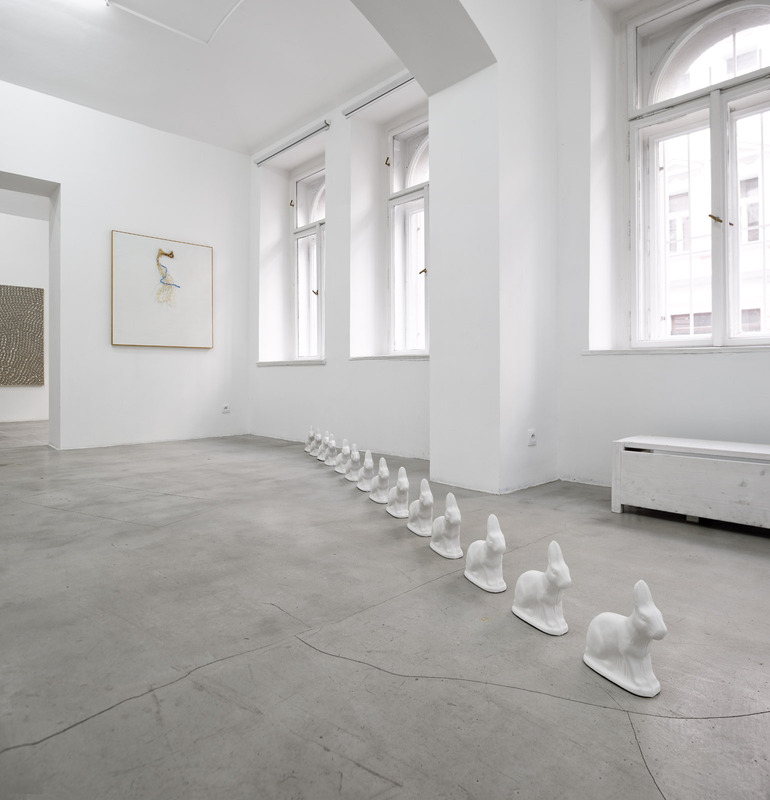 The multiply repeating white space in the open landscape captures a record of the Laying Nappies near Sudoměř activity from 1970, while the enlarged figure of a rabbit cast into an Easter form refers to the artist’s emblematic theme. 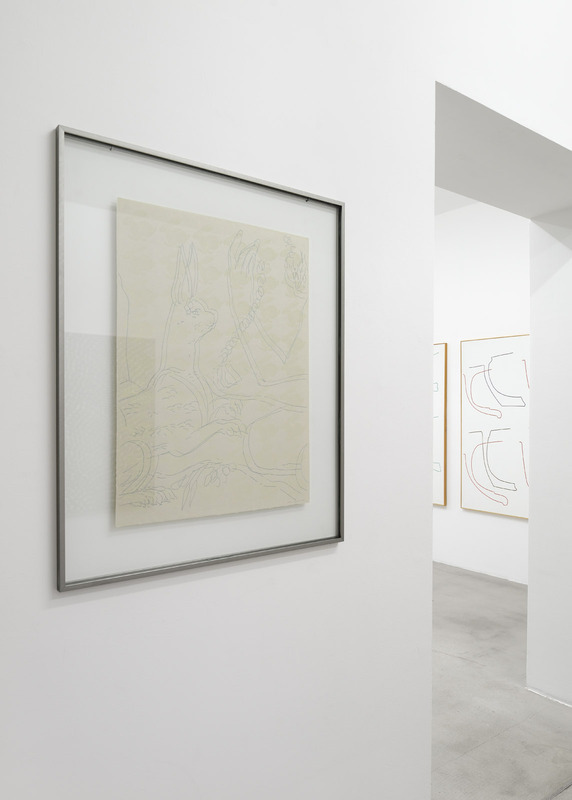 The collection of white canvases then culminates several examples of her work with pictorial quotations often taken from the archeological publications that Zorka Ságlová dealt with in the 1990s. Zorka Ságlová (1942 – 2003) studied at the Academy of Arts, Architecture and Design in Prague in the Textile Studio of Professor Antonín Kybal. In the 1960s she exhibited at the now legendary Constructive Tendencies and New Sensitivity exhibitions. Her work Hay, Straw (1969) aroused significant attention – as part of the Somewhere Something exhibition in the Špálová Gallery. In the period of normalization she was not permitted to exhibit, at the beginning of the 1970s she was nevertheless invited to participate in exhibitions in Paris and the United States. 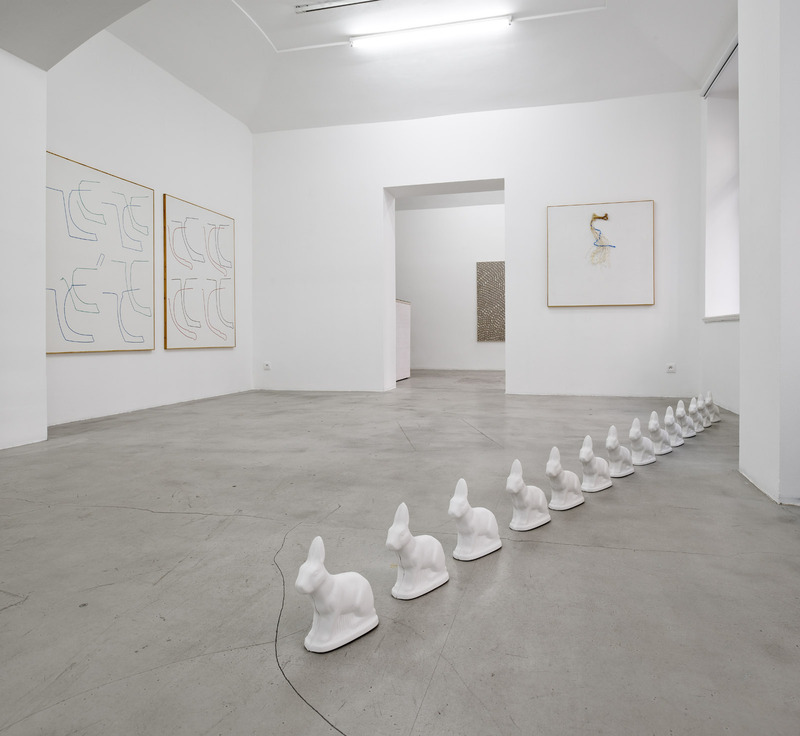 In the international context, her works reappear from the end of the 1990s at exhibitions Out of Actions (1998, MOCA Los Angeles, MAK Vienna, MAC Barcelona, and Museum of Contemporary Art Tokyo), Ends of the Earth (2012, Haus der Kunst Munich, MOCA Los Angeles) and Art in Europe 1945 – 1968 (2016, ZKM Karlsruhe). Of her large exhibitions in the Czech Republic we will name at least the extensive retrospective organized in the National Gallery in 2006 or the exhibition in the Moravian Gallery in Brno (2006), in the Benedikt Rejt Gallery in Louny (2007) and most recently in the Gallery of Modern Art in Hradec Králové (2017).